HomebrewandBeer.com forum • View topic - Show us your gear! Hey all, long time no type. With the birth of our twin girls last December brewing for me has taken a back step in favour of fatherly duties and all the rest but with them a bit easier to manage at 12months old, brewing is back on the cards. Have managed to put down 2 brews in the last week which is exactly double the previous 11 months efforts! So with Xmas done and a couple new beer books on the shelf, All Grain has taken my eye and am wanting to gear up for it over the next couple of months. Looking for ideas and insight from fellow Aus brewers on the most efficient and economical way to get into it, idea so far has been to get ahold of some CUB kegs and modify one for a mash tun another for a HLT and a third for the boil. Am I thinking clearly or in LA LA land? Re: Show us your gear! Having just got into AG myself, I can recommend going brew in a bag. I use Birko 40-litre electric catering urn (it was about $270, but it's by far the biggest outlay). 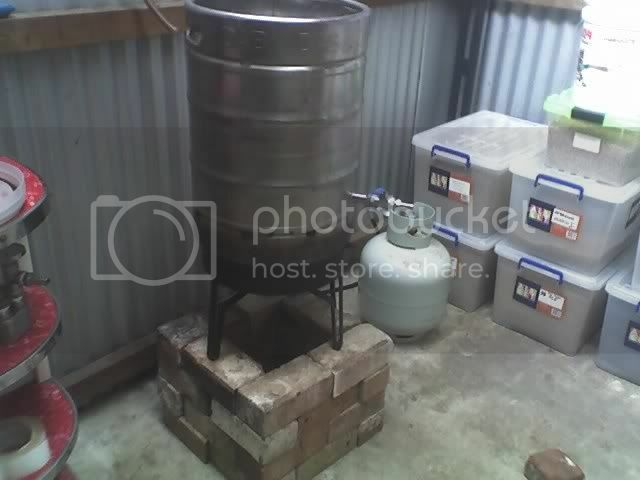 Others use large stock pots or kegs and do it on a stovetop or using a gas burner. The advantage of BIAB is that you only need one vessel so it takes up a lot less room and is a far simpler setup than a full three-vessel setup. Electric also has its benefits. Brew day is dead easy. I've got two under my belt already and the second one was a walk in the park compared to the first. And if you decide down the track you want to go 3V you can use the urn for a HLT. The only downside I have come across with the urn so far is the time that it takes to heat the water to strike temp, then to boiling after the mash. It's probably in the order of 40 mins to an hour for each. But on the flip side of that you can safely leave the urn unattended, which I'd be extremely hesitant to do with a gas burner. Discussion on 3V & BIAB and electric v gas. Oliver wrote: And if you decide down the track you want to go 3V you can use the urn for a HLT. Oliver if you get a $5 camping mat from the reject shop and cut it to fit around the urn holding it on with an occy strap you will cut those times in half Just take it off when boiling as at this time of the year if you don't you get too much of a vigarous boil and lose too much to evaporation. Also no reason you can't go to the two vessel and use the urn as a HLT AND kettle like I do. Sparge into a cube from the mash tun and then simply gravity feed that back into the empty urn for the boil. Means all electric and dead set easy. Doesn't take long to get 75 degree sparge water to the boil. I have just upgraded from a 19L pot stove top maxi-BIAB (overstrength boil then dilute when I add to the fermenter). I purchased a 50L stainless steel pot (decent quality too! I think) with 2x 2200W electric elements and a I attached a ball valve and tap and it only cost me $280 total. I just did my first 28L brew in it just before Christmas. It only took 20-25mins to bring 30L up to my strike temp of 70C (for mash temp of 66C) and then a further 20-25mins to bring it to the boil. Once it was boiling I switched one of the elements off and it maintained a rolling boil quite well. I sparged with 8L in my old 19L to bring my total end of boil volume up to 28L and to increase my efficiency, but you could add the entire volume in at the start with BIAB. It was soooo much easier than what I had to muck around with previously so I'm very happy. I could also probably squeeze out a double batch in the 50L pot if I did an overstrength boil. I have a 3 vessel setup. 55L Willow esky is my mash tun - when not being used as a mash tun it's an esky. 50L keg to boil the wort in, sitting on a NASA/turkey burner. Plate chiller - one of the most expensive parts of my brewery but easily the most important in my opinion, so much so that i recently upgraded it from the 20 plate pictured to a 30 plate. Brew in a bag is another option but I'll leave those with experience with that to talk it up. No pumps on my setup so it's quite basic compared to most, even more so given i have been using the same setup for >4 years and haven't upgraded. p.s. i also have a small batch setup - a 15L cylindrical esky for the mash tun and a cheap 30L aluminium pot for the kettle. This is one pic of my setup. 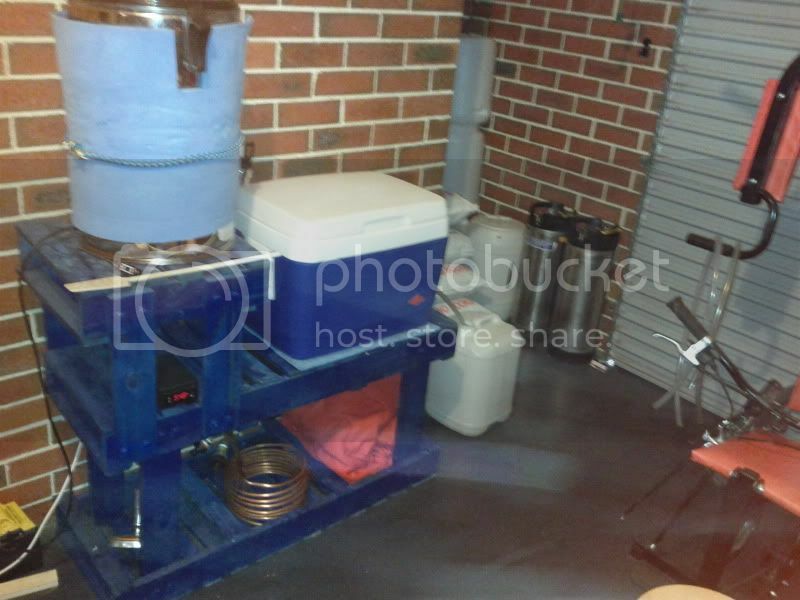 A 40L urn(control box operated for temp) as the HLT gravity fed into a 45L esky with a stainless braid in a circle connected to a brass T and out thru a ball valve. Drained into a 30L cub. The cube is then drained back into the urn for the boil and a copper immersion chiller cools it all down. Then I simply gravity drain the wort into the ferment and the height gives great aeration. All on my brew stand built out of two pallets thats sturdy as and a great height for both filling the urn and filling each stage of transfer. A monster mill with 5KG hopper does all the crushing and my grain is stored in tubs the same as the good Dr's above. so easy, so simple but so effective. All electric so I don't have to bother to open up the garage on those cold winter days like I would have to with gas for ventilation. drsmurto wrote: Brew in a bag is another option but I'll leave those with experience with that to talk it up. I don't think I have the experience to "talk it up" as such. Suffice to say when stovetop BIABing a 19L pot is better than a 15L is better than a 12L etc. etc. Sorry I can't post pictures as I'm still semi-bloody-computer-illiterate. But it looks something like this http://www.google.com.au/imgres?q=19L+s ... 29,r:0,s:0 but with a pillow case inside. And sitting on a stove. This isn't going to turn into one of those HERMS/RIMS/3V/BIAB mine's better than yours wars, that they have over on that other site, is it? No war intended, I actually started browsing through that thread on the 'other' site after starting this topic. Didn't know it was there when I posted this, I have thus far procured a couple of 50lt kegs (legally and after much stuffing around I might add) and have ordered a 50lt alloy stockpot as I can't be stuffed getting a third keg after the run around I had. 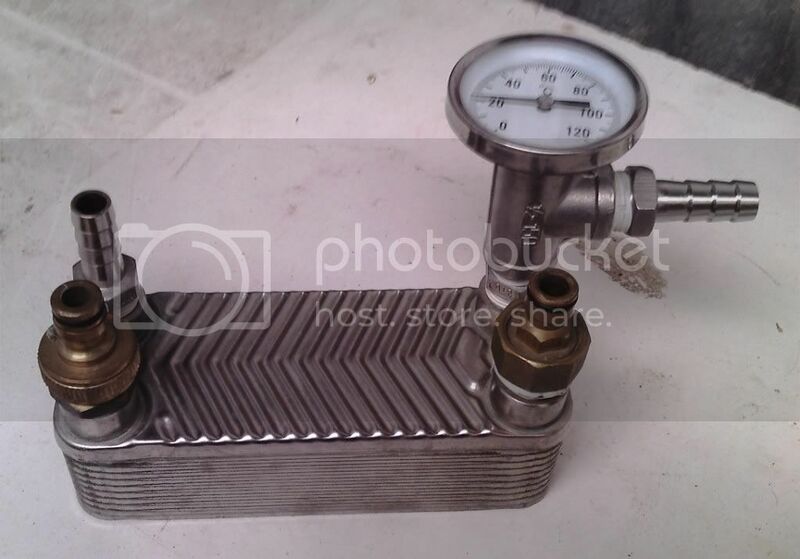 I am going to convert the alloy pot to a HLT with the addition of a ball valve and thermometer, one of the kegs to boil in and the other will become the mash/lauter with a 3pc ball valve, thermometer and manifold for sparging. Will start looking for a burner shortly I guess. grain mill and wort chiller are on the list too. Not rushing too much just acquiring the bones first before fleshing it out. Happy to brew with extract for a bit longer. I think a lot of your setup has to do with how much you can be bothered to do yourself. 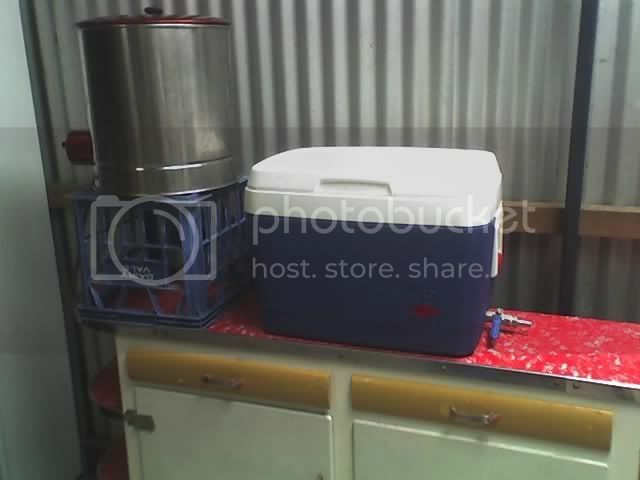 My system consists of an ebay HLT (like this but 40L http://www.ebay.com.au/itm/30-litre-tea ... 41610a412b), 50L rectangular esky with a home made copper manifold ($25 of copper from Bunnings), and a Craftbrewer $149 SS Pot. 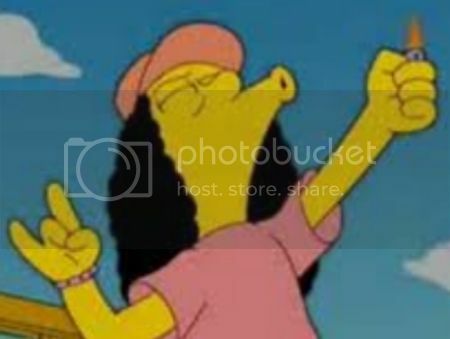 I am not saying this is the way to go, as there are things I would change. The Craftbrewer pot is terrible as a Kettle because it is too thin, however I have seen it converted simply into a Mash Tun with the use of circular false bottom and this works great (provided you put a gym mat around the outside. Thinking of changing to a Handy Import 71L pot in the future as most of my batches now are doubles. HERMS is on the top left HLT on the right with mash tun below. Boiler on the bottom left with the counterflow chiller under the mash tun. This rig can produce 55 litre batches to fill 3 cornies and over Xmas I ugraded the heating elements for faster temperature rise times. This also required a complete rewire of the control box to compensate for extra power drawn which is 27 amp @ 240VAC with all componants switched on. A single March pump handles all the wort tranfers between the vessels which are 60 litre sankey's. Bloody hell tazcat, that looks serious and great. Appears semi portable to move around the garage. wowsers! Nice rig tazcat, nice to see another Taswegian on the board. Are you around Hobart somewhere? barrelboy wrote: Bloody hell tazcat, that looks serious and great. Appears semi portable to move around the garage. This rig is on steel castors as it needs to be moved around to hose down the slops of the floor. They support a lot of weight when making triple batches but even with the HLT at capacity it is surprisingly stable. Since that photo the boiler was restructered from 60L to 80L for more headroom making 55L batches. hyjak wrote: wowsers! Nice rig tazcat, nice to see another Taswegian on the board. Are you around Hobart somewhere? Yeah nothing much happens in Woodbridge the School is still going having a heap of money spent on upgrades over the past few years, the garage closed down through no contest with Woolies and Coles discounting, and the local Pub is mainly for the tourists as the locals find it to expensive to to patronise, my drinking hole is the Snug Tavern. Other than that a quiet place to live and make beer for the spontaneous local sessions that arise now and again.